It was in my calendar, but I missed it. Julia Child’s birthday was August 15th, and it slipped right by me, despite my promise to cook one of her recipes on her birthday every year. My workaround was to reserve half of the lobster I prepared and use it the next day, fudging the date as that on which her birthday was observed. If it works for US presidents, it should work for her. 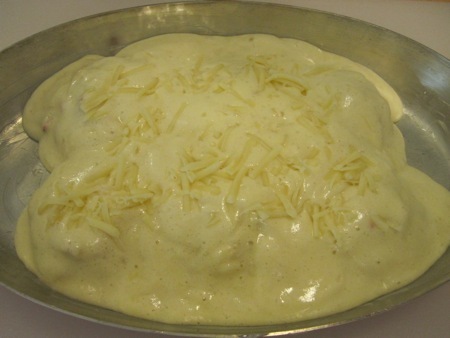 The model for this dish is a clasic dish, which was not devised in the first place for reasons of economy. 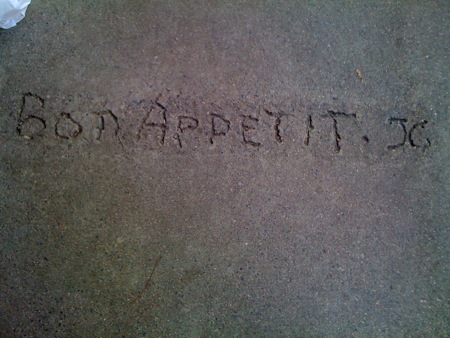 It originated in the Plaza-Athénée Hotel in Paris, which in the old days was reputed to have the most exquisite cuisine-for-the-happy-few to be imaginable. 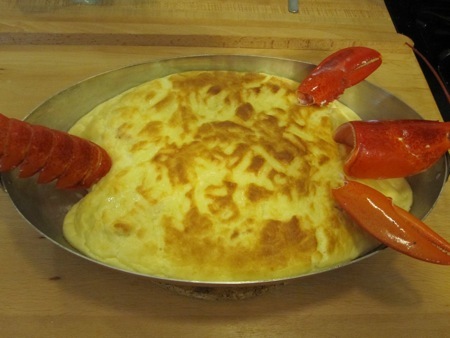 Its base is the famous lobster à l’américaine … Mounding a soufflé over the lobster meat was the Plaza-Athénée’s contribution to elegance. After a bit of chopping and measuring I assembled my ingredients: a cup of white wine; the leftover lobster shells; four tablespoons of softened butter; a tablespoon of lobster tomalley (liver); a cup and a half of chopped, peeled, seeded tomatoes; a medium carrot, diced; a minced clove of garlic (not shown); a cup of lobster stock (paradoxically, making lobster stock requires lobster stock); a tablespoon and a half each of softened butter and flour; a tablespoon of tomato paste; a teaspoon of dried tarragon; a medium onion, diced; half a cup of cognac; and half a cup of beef stock. I added the shells to a pot filmed with olive oil and cooked them over high heat for three minutes before adding the carrot and onion. After another three minutes, I added the cognac and flamed it. Fire! Heh heh, fire! 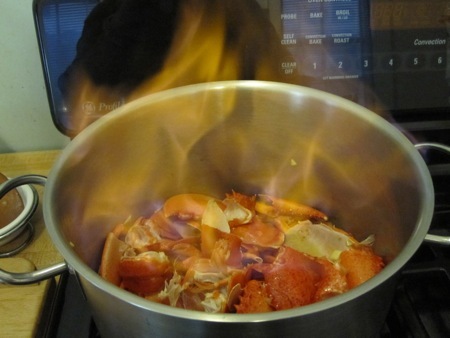 I extinguished the flames with the lobster stock, then added the beef stock and wine. I stirred in the tomatoes, garlic, tomato paste, tarragon, and some salt and pepper before covering and simmering for thirty minutes. I wound up with a pot of deep red lobser stock. 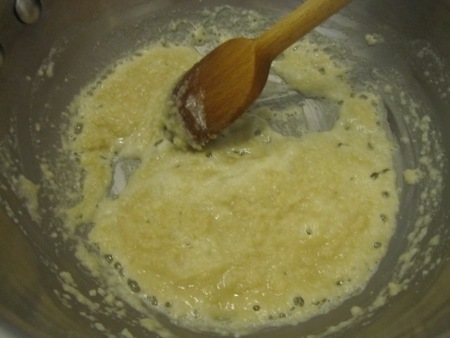 While the stock simmered, I mixed the equal portions of flour and butter together to make a beurre manié, then mixed the larger quantity of butter with the tomalley, and passed it through a fine-meshed sieve. 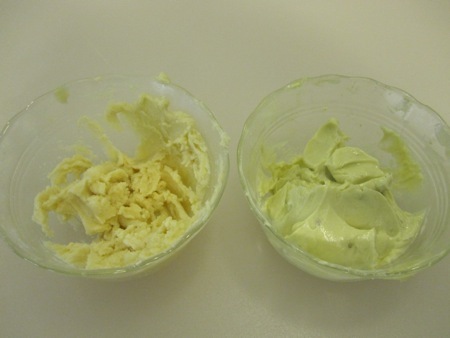 The tomalley butter went into the fridge. 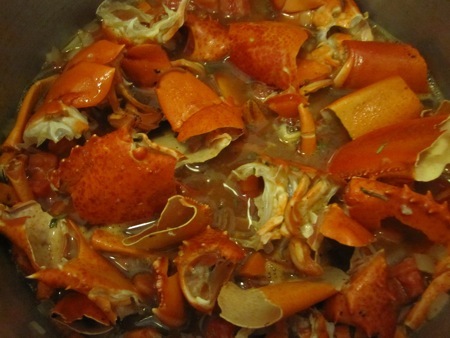 I strained the shells and vegetables out of the stock, passing it twice though a fine sieve and reserving the shells. 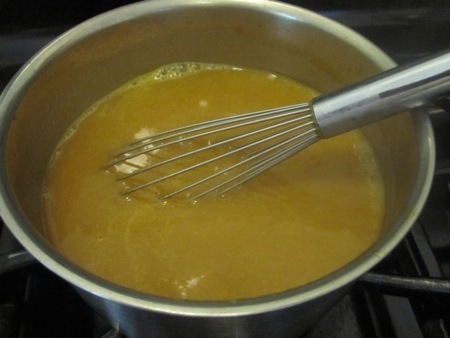 I whisked the beurre manié into the stock and simmered it until lightly thickened, ending up with a cup and a half of sauce à l’américaine. While the stock for the sauce simmered, I assembled the ingredients for the soufflé: five egg whites, lobster meat from three tails and a dozen claws (about ten ounces), a cup of whole milk, three quarters of a cup of coarsely grated swiss cheese, three egg yolks, three tablespoons of flour, a half teaspoon of salt, a quarter teaspoon of cream of tartar, and three tablespoons of butter. 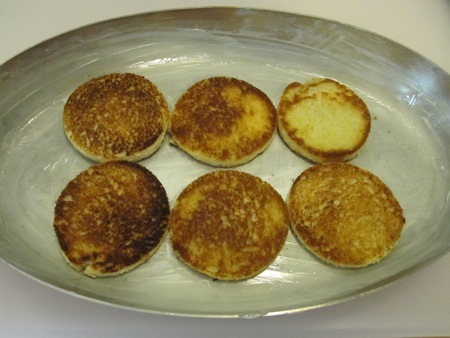 I smeared butter in an oval baking pan and lined it with six croutons made from white sandwich bread. I also pre-heated the oven to 425 °F. 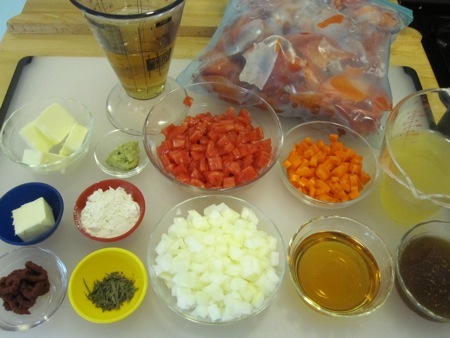 I divided the lobster meat over the croutons and dribbled half a tablespoon of the sauce over each portion. Time for the soufflé: I set the milk over low heat, then made a roux from the butter and flour, cooking it for about two minutes. Off heat I whisked in the hot milk, then added the salt and some white pepper. 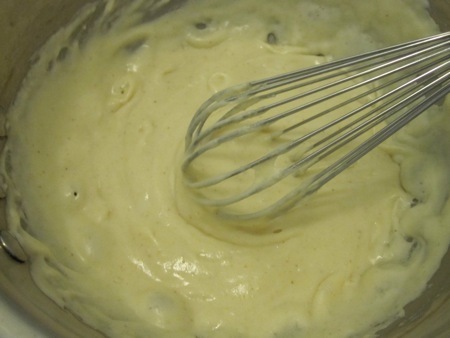 I brought the resulting béchamel to a boil, stirring for one minute. 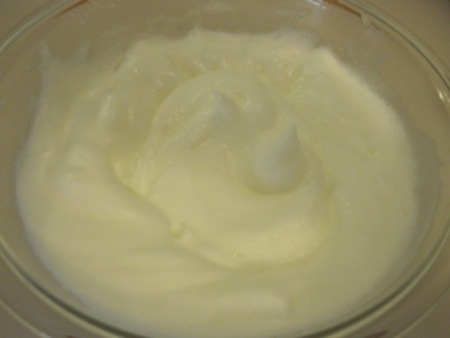 I beat the egg whites until they were foamy, added the cream of tartar and a pinch of salt, and continued beating until they formed stiff shiny peaks. 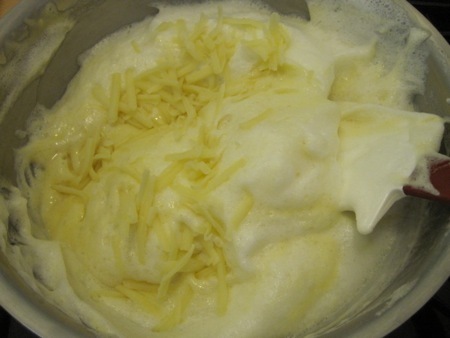 I beat the egg yolks into the béchamel, stirred in one quarter of the egg whites to lighten the mixture, then folded in the remaining whites while alternating with small handfuls of the grated cheese. I mounded the soufflé over the lobster-topped croutons and sprinkled the remaining two tablespoons of cheese over the top. As soon as I placed the platter in the upper-middle level of the oven, I reheated the sauce and thickened it by whisking in the tomalley butter. After fifteen minutes, the soufflé was ready. 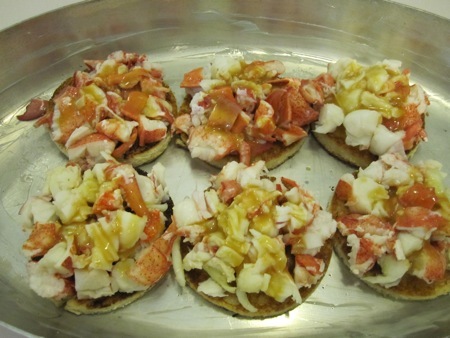 Julia suggested garnishing the plater with a set of reserved lobster shells (“Head, claw, and tail shells announce that this is a soufflé of … lobster!”), so I did. I plated a third of the soufflé, sauced it lightly, and garnished simply with sliced tomatoes and cucumbers. It may surprise you to learn that this was the first soufflé I have ever cooked — it certanly surprised She Who Must Be Obeyed. 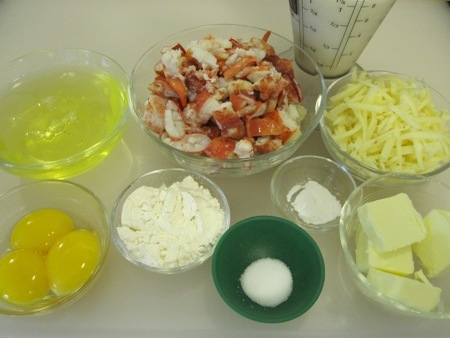 It didn’t collapse, nothing overcooked, it was a lovely conmbination of egg, cheese, and sweet lobster. 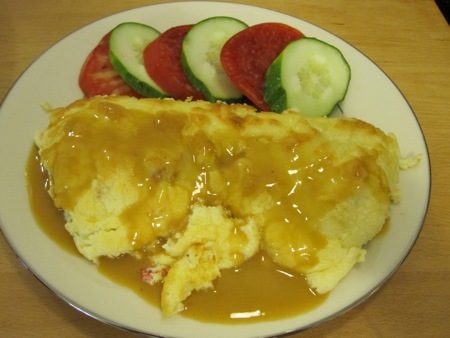 Even He Who Will Not Be Ignored declared it “the best lobster omelette I’ve ever eaten.” I may just have to try my hand at a more traditional cylindrical soufflé, perhaps a dessert version.